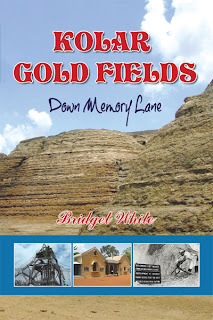 This book “Kolar Gold Fields – Down Memory Lane - Paeans to Lost Glory” has been authored by me as a tribute to KGF and the happy and sublime childhood I spent there. KGF also known as the Little England was Heaven on earth for those of us who had the privilege of living there. We were special people living in that very special place. My book succeeds in capturing and preserving for posterity the nuances and ethos of a bygone era. It is a small attempt on my part to record for posterity, way of life in that once glorious vibrant place called Kolar Gold Fields and at the same time keep it alive in the hearts of its erstwhile inhabitants, which still beats for it. It is a small legacy that could / should be passed on to future generations. “Kolar Gold Fields – Down Memory Lane - Paeans to Lost Glory”undertakes a nostalgic journey of almost 150 years right from the days of the origins of the Kolar Gold Mines, its historical and mythological connections, the arduous and difficult lives of the miners in those early days, the growth of the mines under the British Company of John Taylor and Sons, its gradual decline, and the ultimate closure of the once prosperous Kolar Gold Mining Company in 2003 Thus ending a golden chapter in History, which now lies buried in the annals of time. It finally focuses on the author's childhood memories of growing up as a young Anglo-Indian child in KGF in the 1950s and 60s - home, family, school, playmates, entertainments, games, picnics, etc. It recalls memories of old familiar haunts and landmarks of KGF and the people who were an indispensable part of life in those days. This golden period of KGF post Independence was the period of transition, when the influences of the best of old Colonial India merged with the new emerging independent India.